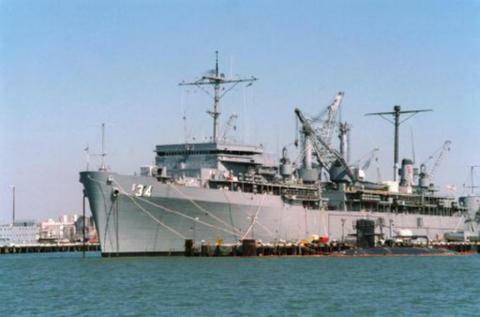 The USS CANOPUS (AS-34), a Simon Lake-class submarine tender, was commissioned on 4 NOV 1965. USS CANOPUS served her country for 28 years, 11 months and 3 days, until decommissioned on 7 OCT 1994. After commissioning CANPOUS call Charleston, SC home and supported the US Submarines there for nine month before deploying to Rota, Spain. After spending nearly three years in Rota, CANOPUS steamed for Bremerton WA and overhaul, in April 1969. Her post overhaul assignment was Holy Loch, Scotland, where she tended the Cold War "Boomers" from May 70 to November 1975. The cycle repeated with CANOPUS undergoing overhaul in Charleston and then returning to Rota, Spain as the station tender from December 1976 to June 1976. She returned to Charleston and subsequently moved south to Kings Bay, GA to finish her career of "READY TO SERVE" the submarine fleet. CANOPUS decommissioned in October 1994. She was scrapped by ABLE UK, Hartlepool, England, in 2003.